According to statistics collected by the US government, fire departments respond to over 300,000 home fires each year. Anything that indicates to firefighters or other EMS personnel the location of a person in the home is beneficial and can hopefully prevent death or injury. 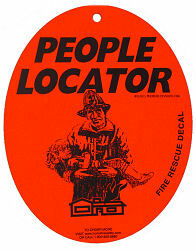 THE PEOPLE LOCATOR was developed with this in mind. It is a removable and reusable fire rescue window decal that easily attaches to the inside of your bedroom window by a simple suction cup (included). The front side immediately identifies the location of your room to emergency personnel while the back side contains fire safety information written in easy to understand words and pictures. Measures 7 inches long by 5.5 inches wide.